Croatia based small indie development studio Indiefferent, behind the mysterious point and click horror/adventure game, has some great news to announce. Square Enix Collective has accepted their game concept and looking to get your feedback and votes. Full release would be on PC and Mac, which they are hoping to get to be released via Steam. Ever get those feelings when you were little kid, especially when in a hotel or unknown house where you feel like something is there or you can’t turn on the light when you go to the bathroom, and all you want to do is hide under the covers? 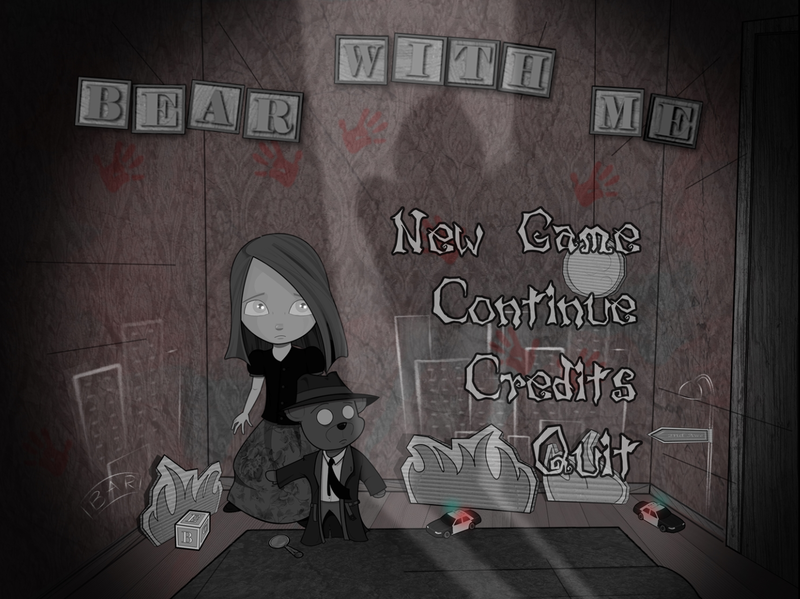 Well you can hide under the covers all you want, but nothing will get done especially in this mix of noir mystery and horror element game, Bear With Me. Take on a game filled with puns, and experience a game that is inspired by point and click classic game titles that include Monkey Island, and Grim Fandango. You, the player, get woken up by the thunderstorm that is brewing outside, and you play the role of Amber, who seems to be missing her brother, Flint, though the storm wasn’t the only thing that has woken you up, a strange and scary unknown laugh is lurking in the dark. Being black and white, it intensifies the horror in this cute little game, and you will be chased along the way. Amber can’t do this all on her own, and with a title like ‘Bear With Me’, you guessed it from the picture above, you get help from a teddy bear. Amber’s teddy bear is known as Ted E. Bear, who is a private detective, or in this case he is part of the FBI (Federal Bear Investigation). 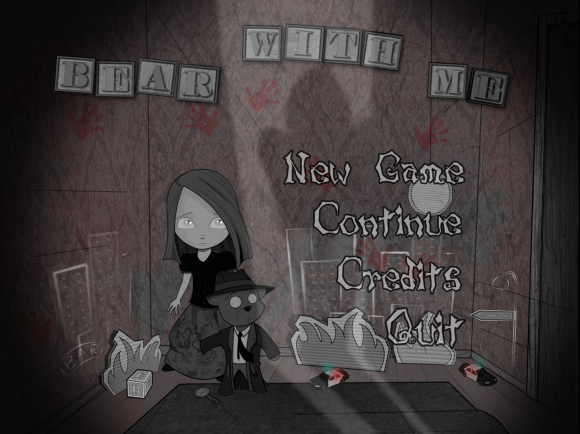 Bear with Me, not only allows players to take control of 10 year old Amber, you will get to choose to play as the mysterious hunter character, Red. Ready to take on this strange adventure filled with noir fun and quirky humor like other classic titles? How will you choose to play Amber and Red in this game? Be prepared to take on Bear with Me in the pre-demo, which is coming soon. Square Enix Collective, a very welcoming community especially when you are an indie studio releasing your first or how ever many games you have made. The process goes from pitching the creative idea your studio has to Square Enix, then once successfully accepted, it will be brought onto the Collective Platform, for then the community to give feedback and vote on. This feedback and voting community continues onto getting help by Square Enix in a partnership, which includes going for crowdfunding campaigns that will help back the ideas and make them more into a reality. With the Help of Square Enix Collective, you will definitely get a big support both ways, especially with recent successes from games like Moon Hunters, which ended in $178,986 of a $45,000 goal, and then there is the recent Black the Fall, which is currently close to £10,000 of a £25,000 goal and still 23 days left. Classic point´n´click mechanic, explore the game with movement and interaction. Hundreds of interactive items to explore, the mystery unfolds in Amber’s house which is full of objects you can interact with. Dialogues and interrogations full of puns, sarcastic, dark and funny from start to finish. Collect and combine items to solve the case of Amber’s missing Brother. You can find out more information on Bear With Me on the Collective Site. Plus like Indiefferent on Facebook and follow them on Twitter in order to get up-to-date information on Bear With Me.